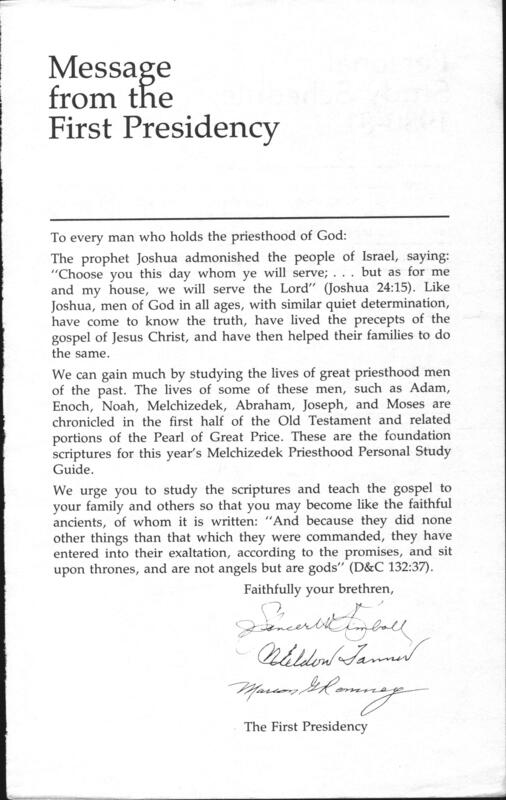 This Melchizedek Priesthood lesson was produced under the First Presidency's sponsorship. 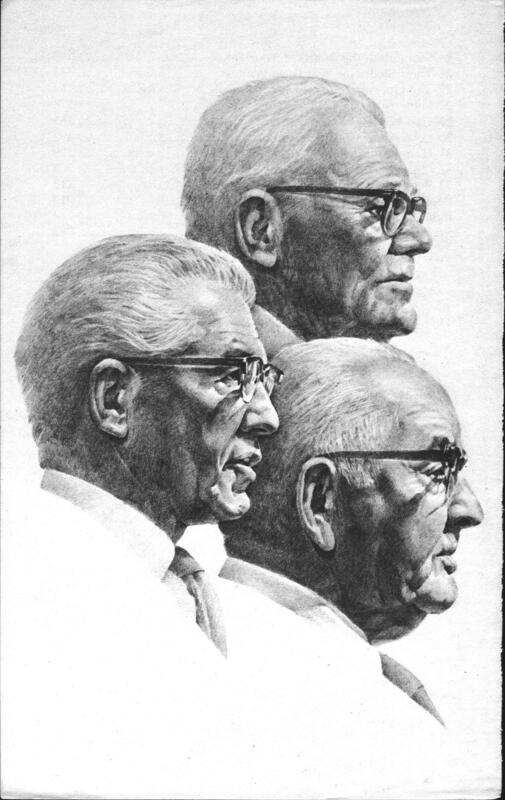 Based on the introductory portrait of and message from the First Presidency, it appears also to have been approved for publication directly by the First Presidency as a body. 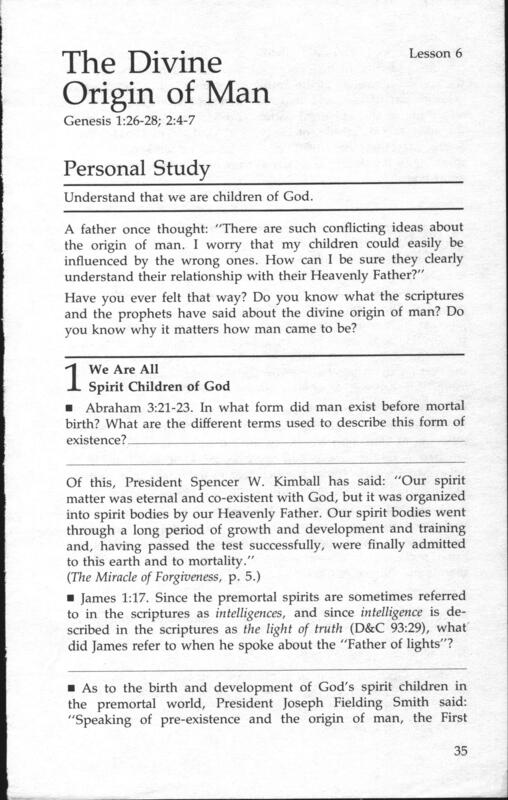 Therefore, the comments of various Church leaders including President John Taylor, President Joseph Fielding Smith, and Elder Bruce R. McConkie found in this lesson are at least as authoritative as the talk "The Earth and Man" by Elder James E. Talmage, which is quoted in its entirety by William E. Evenson and Duane E. Jeffery in their book, Mormonism and Evolution: The Authoritative LDS Statements (Salt Lake City: Greg Kofford Books, 2005, pp. 71-94). 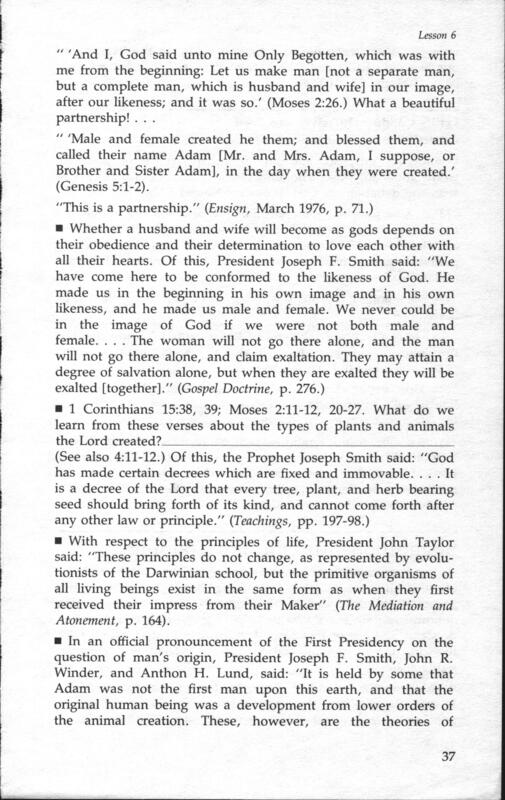 There are nine images in this post, all taken from the 1980-81 Melchizedek Priesthood Study Guide. Gary, thanks for taking the time to scan and post this interesting material. I think whatever is currently in press is of greatest importance, but still this is interesting. 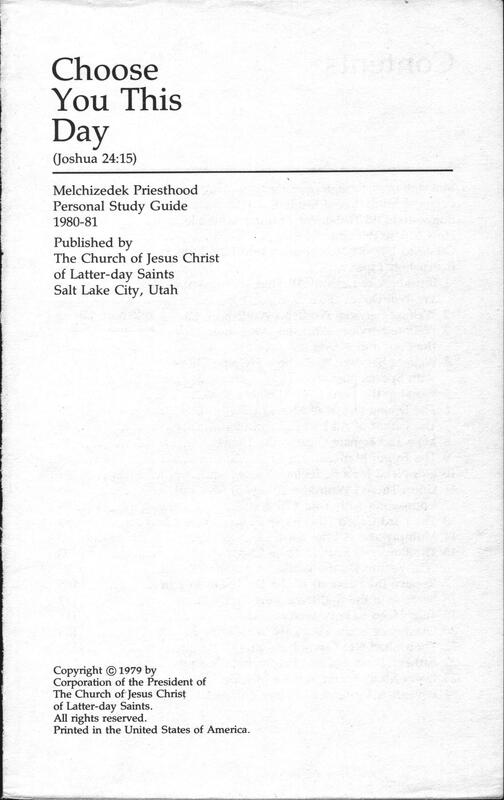 As stated above, the 1980-81 Melchizedek Priesthood Lesson 6 was produced under the First Presidency's sponsorship (see criterion a, p. 8). Based on the introductory portrait of and message from the First Presidency, it appears also to have been approved for publication directly by the First Presidency as a body (see criterion c, p. 8). Therefore, the lesson meets two of the three conditions, any one of which supposedly qualifies a document to be in Mormonism and Evolution's Appendix. Last month, I posted four additional articles detailing documents that are conspicuously absent from a book that claims to present "in full all known authoritative statements." 4. Joseph F. Smith on Theory and Divine Revelation. 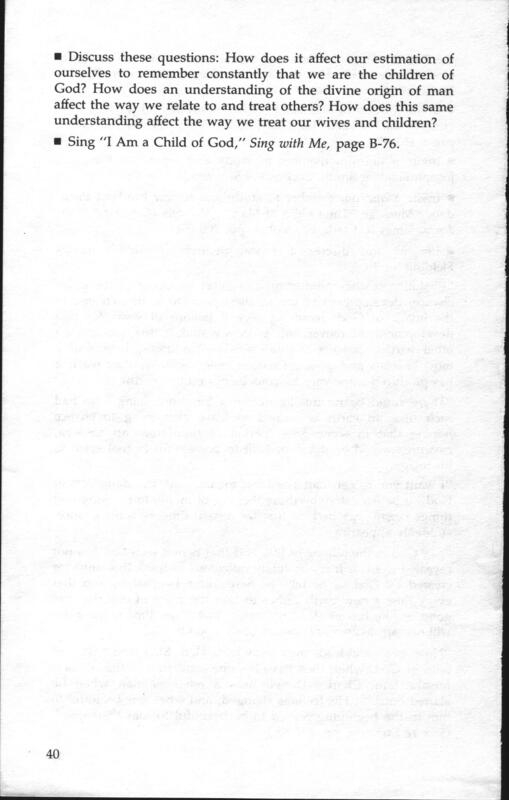 L. Letters from the Church Public Relations department not identified by date or addressee (p. 113). The omissions may have been unintentional. The effect, however, is deceptive and it greatly diminishes the value of the book. Thanks for making these pages available. I'm not sure if I agree that this manual constitutes an official statement. I'm guessing that the note from the First Presidency introduces the whole book, not that particular chapter. I have the MP study guides 1-4 published in the late 80's - early 90's. They each have an introductory letter from the First Presidency, but I wouldn't construe that to mean that the First Presidency specifically endorses every single line. 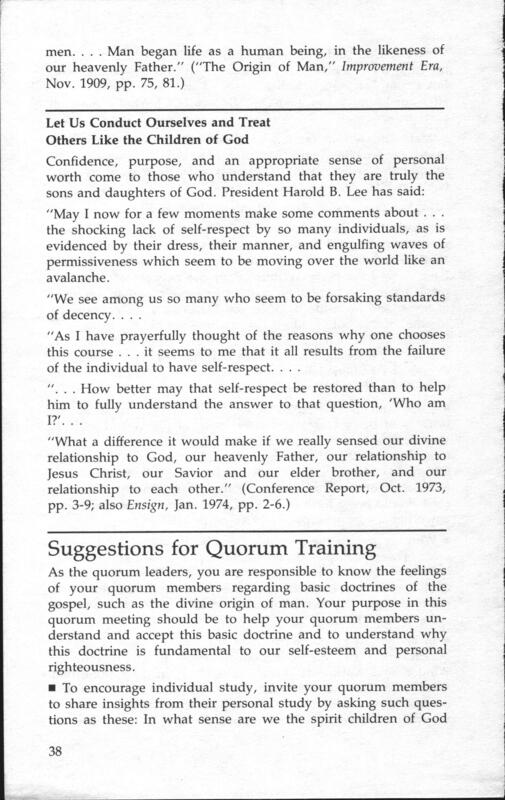 It seems more likely to me that the content was written and approved by the regular correlation process, and the First Presidency provided a message of exhortation for each one. In other words, I don't think I would view this particular manual as more official or authoritative than any other manual published by the Church. It should certainly be on the radar screen, but for the purposes of your argument concerning Evenson and Jeffery's book, I think there is a difference between this and the Joseph Fielding Smith priesthood manual since he actually wrote the contents. It's also worth noting that the particular inference this manual makes about Luke 3:38 seems to be absent from Church materials since then, as I've discussed before. Hoyt W. Brewster, Manger, Adult Curriculum, Curriculum Planning and Development, wrote in response to criticisms of the priesthood manual that the lessons had been "fully approved by the correlation committee of the church; that is not to say that a future correlation committee might not desire changes in [their] content." Let me revise what I said above. I think it would be difficult to justify including "Earth and Man" while excluding this material. Jared said, "the particular inference this manual makes about Luke 3:38 seems to be absent from Church materials since then." That's not completely true. 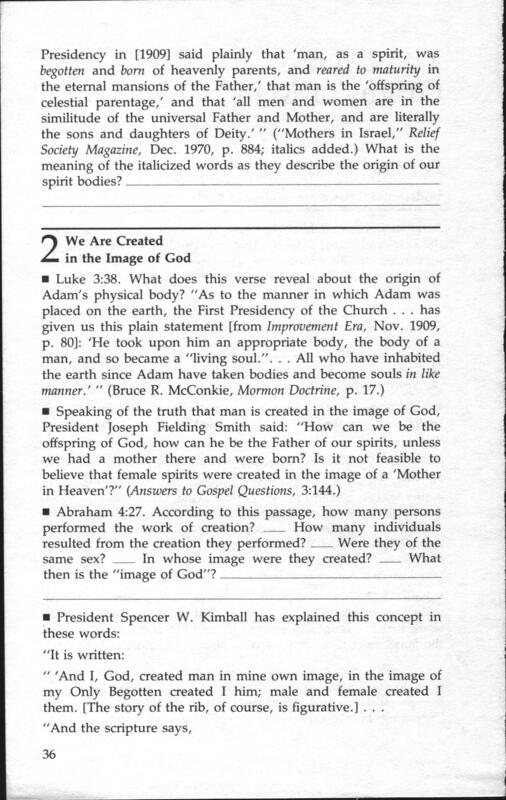 The Topical Guide in the LDS edition of the Bible makes the same inference in its entry for "Man, Physical Creation of." Gary, maybe if you contact the authors they'd include these sources or else clarify their criteria in a future edition. Christian, My response to your first comment above was fairly long and identified several documents that seem to meet the stated criteria but were left out of Mormonism and Evolution for whatever reason. The tone of your most recent comment suggests that you might agree with me thus far. Is that true? As you can see, my book review of Mormonism and Evolution: The Authoritative LDS Statements, has already involved several posts. But the review is not yet complete. 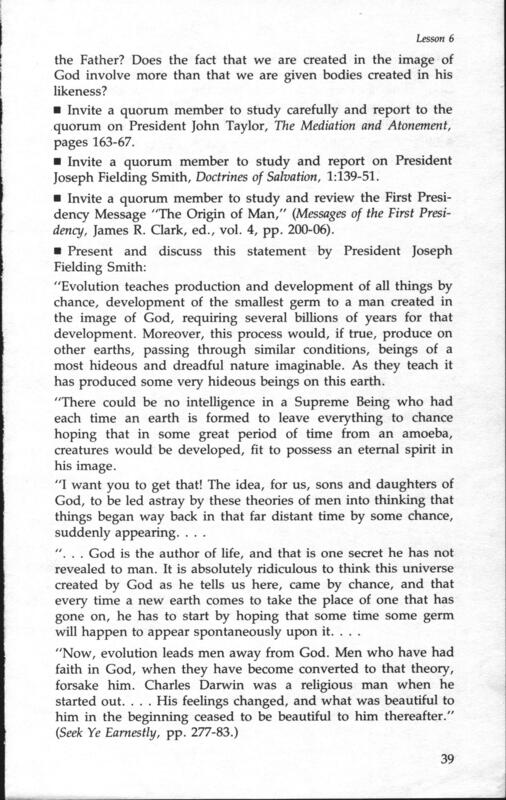 Next, I'll be reviewing Mormonism and Evolution's Appendix Document A, "First Presidency Instructions to the Priesthood: 'Origin of Man,' 1910." This document, I feel, does not belong in the book. Gary, I do basically agree that the things you point out seem to meet their criteria. I suspect they might try to refine their criteria to exclude lesson manuals, but I'd be curious to see their response. One disagreement I have with their criteria is that I don't think anything not published by the Church---including statements by a President of the Church---should be considered authoritative.